800 million people worldwide still lack food security. I am a human rights activist who has spent the last two decades of my life fighting for the land and environmental rights of Indigenous Peoples. I have worked at the grassroots level. I have led large indigenous organizations and movements. Throughout my life, however, I have never forgotten my roots. I am an indigenous woman from the Kankanaey tribe, situated in the northern region of Cordillera, a mountainous region of the Philippines. For us, food is part of our culture. As a child growing up in a forest village, we always had an extra pot of cooked rice so we could feed unexpected guests. Our welcome greeting to every visitor was “Have you eaten?” Sweet potato is part of our identity as Kankanaey people. I grew up tending our sweet potato garden, and I always enjoyed eating my grandmother’s delicacies made of sweet potato flour. Like us, food has a special meaning for millions whose lives are tied to the lands that produce this food. Food means identity and culture. Food represents a way of life passed down from generation to generation. When we sow seeds in our gardens and fields, care for our forests and rivers, put food on the table; we are celebrating the deep, timeless connection and reciprocal relations we have with our lands—and we are feeding the rest of the world, too. Seventy percent of the world’s food comes from small-scale producers. Many are communities that rely on their customary lands to grow food. Their forests also underpin global food security. Indigenous Peoples and local communities are doing our best to keep the planet from plunging into a global food and climate crisis, despite increasing threats against our lands, our autonomy, and our lives. That’s why on World Food Day, I join the Land Rights Now campaign in renewing a global call to action: we are calling on governments to recognize and secure the land rights of the nearly 2.5 billion people who rely on community lands to feed their families and the world. Indigenous Peoples and local communities largely lack secure rights to the lands we have long protected and depended on for our food and livelihoods: governments only recognize our rights to 10 percent of the world’s land, despite the fact that we have customary rights to at least 50 percent. This gap not only leaves us vulnerable to land grabs and food insecurity, but also threatens the global community from climate change disasters and irreversible biodiversity loss. This is documented in a brief launched by Land Rights Now for World Food Day: “Recipe for Global Food Security: the fruits of securing indigenous and community land rights”. So I am calling on you—every individual who is passionate about eradicating hunger and ending food insecurity for 800 million people worldwide—to join us in calling for strong policies to secure land rights, and hold governments, investors, and corporations to account. We all need to take action in ending unsustainable land and resource use and inequality if we are to achieve zero hunger. 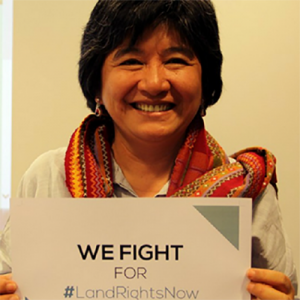 About the author: Joan Carling is a human rights defender from the Philippines who has been leading advocacy for indigenous land and environment rights for more than 20 years, working at every level to effect change and give voice to marginalized peoples. She has served as the Secretary General of the Asia Indigenous Peoples Pact, Chairperson of the Cordillera People’s Alliance, and a member of the UN Permanent Forum on Indigenous Issues. Joan is currently co-convener of the Indigenous Peoples Major Group for the Sustainable Development Goals and a member of the Advisory Board for the Land Rights Now Campaign. She was recently honored with the UN Environment’s Champions of the Earth Award for lifetime achievement. Follow her on Twitter at @JoanCarling. Header image by Andrew Smith on Flickr via Creative Commons license.